If you would like to install SBGrid tools on a machine that is frequently disconnected from the network, like a laptop, or don't want to set up an NFS-shared software installation, it is possible to install the software to the hard disk on your local machine. We have a GUI-based installation client for MacOS that allows software to be selected, installed, and updated on demand from SBGrid servers. There is also a command-line client for MacOS and Linux that will allow installation and upgrade of individual titles from the command line. Information on installation of our MacOS GUI. Information on installation of our command-line tools for MacOS and Linux. While we recommend the software tools above, if you would like to install your software from a local source, there are script-based tools in the SBGrid programs tree that will create a copy of the software on your local hard disk. The 'sbgrid-laptop' script allows you to select individual applications from the software distribution for installation on your laptop. By default only the latest version of the selected applications will be installed. The 'localsync' script allows you to copy an entire operating system software branch to your local machine. This script can be used on laptops, but each branch is quite large in terms of disk space usage. 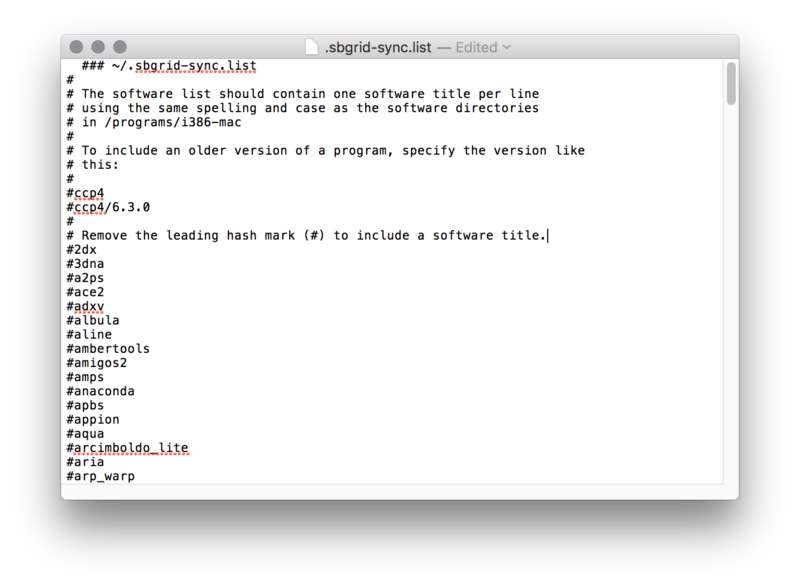 Finally, the 'sbgrid-sync' script will allow you to install software from SBGrid servers. This script is deprecated in favor of the better CLI tools above and its use is discouraged. This script installs software from your own local installation. This script requires an account on a local machine with access to the SBGrid softare collection. Only latest versions will be installed. All versions of the software will be installed. This script installs software from SBGrid's servers. an account on SBGrid's server is required. THIS INSTALL METHOD WILL NO LONGER BE SUPPORTED IN A FUTURE RELEASE. You can create a customized local installation of the software using the ''sbgrid-laptop'' script located at ''/programs/share/bin/sbgrid-laptop''. This script requires you to have an SSH login to a computer that has access to an SBGrid software installation and will let you specify which packages you want to install. SBGrid software on a laptop. -d    Debug mode creates a log file for troubleshooting purposes. Edit the software download list. -i    Initial set up and installation of the SBGrid software. -s    Re-run SSH key set up process. -t    Test your current configuration. -v    Verbose option for the file transfer. agent process to handle authentication for the file transfers. Copy the script the machine you want to install the software on, and then run it in install mode: ''./sbgrid-laptop -i''. Follow the prompts on the screen to create your configuration file, your software installation list and to enable logins using an SSH key for authentication. There is a script in the programs tree that can be used to copy the appropriate branch from a shared installation to your laptop or workstation. The script will prompt you for your sudo (admin) password in order to create the programs directory, and then it will prompt you for your login password to the server that hosts your programs installation. This will copy the entire branch for your architecture to your local hard drive. For the OS X branch, this will use approximately 100 GB of disk space. You should use a network cable for the initial download, since the download is fairly large. Subsequent runs of the 'localsync' script are differential; they will only copy new or changed files, so they can be run over a wireless connection. The script can be run at any time to make your local installation match the installation on your local server. While we recommend that sites export their software installation via NFS to their workstations, it is possible to use rsync to copy the master installation to each workstation. This method has the drawback that it requires manual intervention on the part of the local sysadmin, and updates will not be instantaneous or simultaneous for all machines. On each client machine, you'll need an 'sbgrid' user. That user will have a passphraseless ssh key that lets it log into the machine that hosts your primary installation. Each client machine will have a cron job for that sbgrid user that runs at 2 AM that will sync the programs from the master installation to the client machine. Here is a basic command run down. 'server1' holds the programs installation and 'client1' is what will be connecting to it. Check the free space on /. If there is not enough free space on the root volume, you'll need to find space on a local volume. Login as 'sbgrid' on client1. exclusively to member laboratories of the SBGrid Consortium. To hush this license message, run 'touch ~/.agree2sbgrid'. This script can be found in the programs installation at /programs/share/bin/sbgrid-sync. collection on your laptop or workstation. please email <accounts@sbgrid.org> for assistance. default version of the software titles will be installed. -e    Edit the software download list. Once an account has be created at SBGrid, the software can be installed with for a username (at SBGrid) and a path for the software installation. the -i flag. The user will be prompted with a list of software to add. | installation. We will start with a list of all the software titles. | Remove the leading hash mark (#) to _include_ a software title. Any titles NOT preceded with a '#' character will be installed. Once the editor has quit, software installation will start. | Creating an rsync include list to download files. | Running rsync to download the latest software.